The rest of the Parkway was completed and opened to public use by 1966, but it took another two decades, much controversy, differing opinions of how to route the highway around Grandfather Mountain, and a very creative engineering team to solve the problem.&nbsp; The challenge lay in building a roadway that wouldn&#39;t damage one of the world&#39;s oldest mountains, a slope strewn with boulders that would have been prone to rock slides had traditional methods been employed. The firm of Figg & Miller Engineers, Inc. developed the design of a viaduct, which is actually a bridge over land. To protect the land beneath the structure, the viaduct was built from the top down using pre-cast segments supported by piers. The design included almost every kind of alignment geometry ever used in highway construction, and no two of the 153 segments are alike. 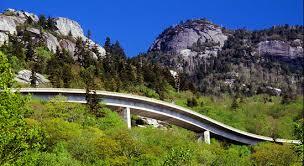 The result is the Linn Cove Viaduct, the most complicated bridge ever built, a dramatic sweeping &quot;S&quot; curve that winds around Grandfather Mountain at Linn Cove. Located at Milepost 304.4 on the south side of the viaduct is a bridge museum and visitor center maintained by The National Park Service.&nbsp; Enjoy walking trails that originate at the center and travel under and beside the viaduct and connect with the Blue Ridge Parkway trail network. There are other attractions and places of interest along with the Linn Cove Viaduct around our section of The Blue Ridge Parkway. For instance Doughton Park, Moses. H. Cone Park,&nbsp; Flat Top Manor, Julian Price Memorial Park, and the Cascade Falls are all a short drive from our West Jefferson. When you purchase Ashe County Real Estate for Sale you can enjoy owning property near the Blue Ridge Parkway and many other amazing places for outdoor activity. In spring, summer and fall, folks enjoy activities like hiking, cycling, rock climbing, fishing, motorcycling, and driving along The Blue Ridge Parkway. Check out A1 Mountain Realty&#39;s listings to find the very best Ashe County NC Real Estate; many properties have some great views and are near to The Blue Ridge Parkway. Contact us to find out more about the affordable NC Mountain Homes for Sale. Visit us in Downtown West Jefferson or call us at 336-846-4900 for the very best High Country Real Estate.